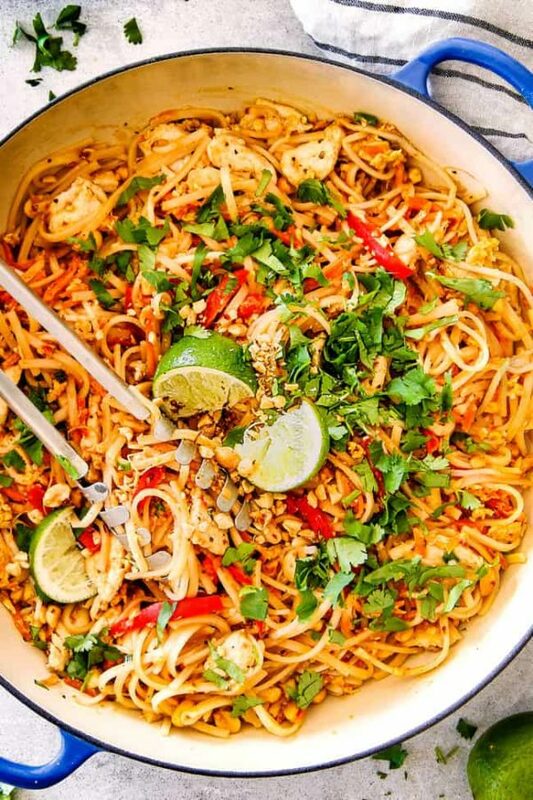 BEST EVER Chicken Pad Thai (Video) with Pantry Friendly Ingredients! This Chicken Pad Thai Recipe rivals any restaurant but is made with pantry friendly ingredients, is less expensive and on your table in 30 minutes! Devour your favorite Chicken Pad Thai smothered in the most irresistible savory, sweet, salty, sour Pad Thai Sauce with crunchy peanuts and veggies! 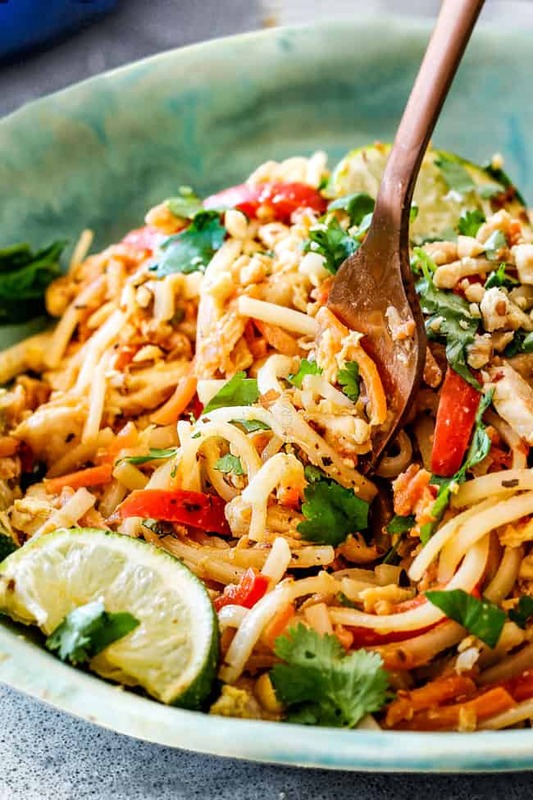 You can completely customize your Pad Thai recipe to include whatever veggies or protein you want to make it Chicken Pad Thai, Shrimp Pad Thai or Vegetarian Pad Thai! The possibilities are endless and so is the deliciousness! Thai food is one of my favorite foods in. the. world. with it’s depth of layered flavors that create a savory symphony with every bite. I love Thai food so much, it’s usually my cuisine of choice for every milestone such as college graduation, engagement, birthday celebrations, transplant anniversaries, etc. I’ve created several of my restaurant favorites into takeout fakeout versions from Panang Curry, Red Curry (one of my Most Popular Recipes of 2017), Yellow Curry, Coconut Curry Chicken and Tom Kha Gai. 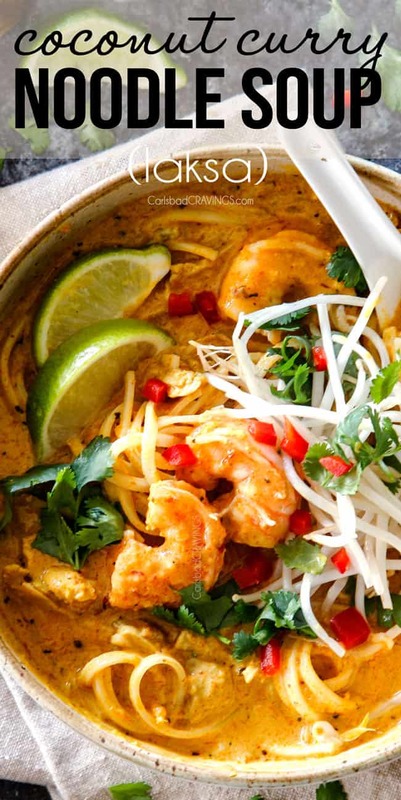 I’ve also created many not so traditional Thai recipes from my wildly popular Thai Chicken Noodle Soup and Thai Pineapple Peanut Chicken Satay to my equally delicious Slow Cooker Thai Coconut Chicken and Wild Rice Soup, Thai Chicken Pizza, Thai Sticky Orange Chicken, Thai Butternut Squash Soup, and on and on. And because today is actually my birthday (and yes, we are going to be eating lots of Thai food), I giddily bring you this Chicken Pad Thai recipe! If you have ever dined at a Thai restaurant, then I guarantee Pad Thai has been on the menu. It is common street food dish in Thailand and arguable the most popular Thai food in America because its aHHH-MAZING! Pad Thai is a favorite stir fried rice noodle dish interpreted as “Thai-stir fry.” It is characterized by the soaked rice noodles with their chewy texture, stir fried with eggs, either chicken, shrimp or tofu, tossed in a harmonious sauce that’s salty from the fish sauce, sour from the tamirand pulp (I use pantry friendly substitutes in my version) and sweet from the palm sugar (we substitute brown sugar in my version) with plenty of crushed peanuts, cilantro and bean sprouts. Pad Thai became popular in World War II when Thailand was facing a rice shortage. Rice noodles, on the other hand were in abundance so the Thai government encouraged the substitution of rice with rice noodles. 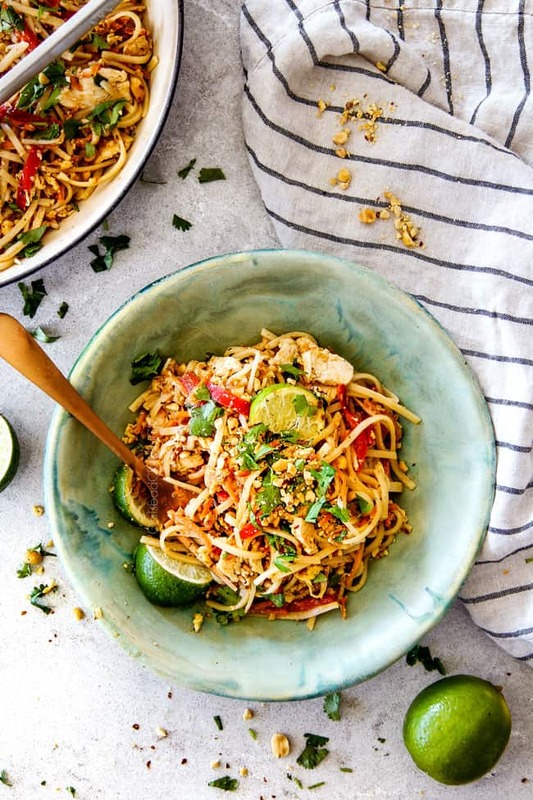 The citizens mixed rice noodles with various vegetables and proteins resulting in a new inexpensive, instant classic known as Pad Thai that the world has been enjoying ever since. What noodles are best for Pad Thai Noodles? Every restaurant Pad Thai recipe begins with rice noodles. Rice noodles are made from rice flour and maintain their perfectly al dente texture if not overcooked initially, giving Pad Thai its wonderfully slightly chewy characteristic texture. Rice noodles can be found in the Asian section of your grocery store. You are going to want rice noodles that are 1/4″ wide, resembling the width of fettuccine. The noodles I use are easily accessible Thai Kitchen Stir Fry Rice Noodles. If you can’t find rice noodles, you may substitute fettuccine. Your Pad Thai Noodles won’t be as “authentic” but to be honest, I have tried both rice noodles and fettuccine and the fettuccine is still outrageously good if you can’t get your hands on rice noodles. Different rice noodle brands have slightly different soaking times, but the method is generally same. Bring approximately 4 cups of water to boil in a medium saucepan then remove the pan from heat. Add your noodles and let stand approximately 8 minutes OR until your noodles are limp but they’re still slightly firm. You will want to take care to test the noodles on the early side of soaking time so they don’t overcook – we do NOT want mushy noodles! We want our noodles to be slightly crunchy and under cooked just a bit at then end of soaking because they are going to finish cooking when we stir fry them in the sauce. Once the noodles are al-dente, drain them and rinse them under cold water to stop them from cooking. 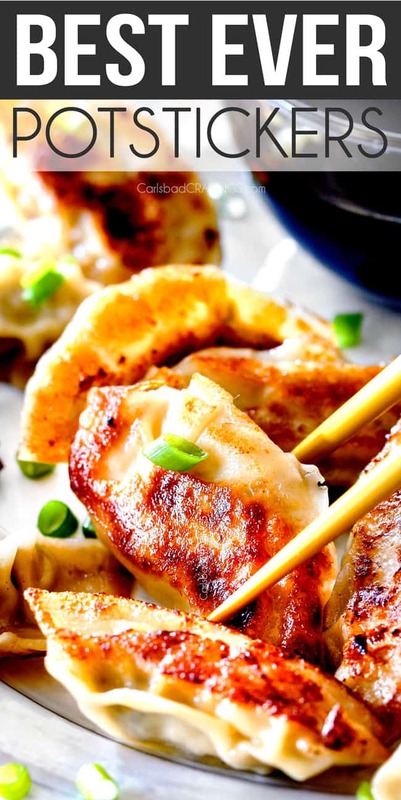 Next, toss them with some olive oil to keep them from sticking together while we get our stir fry on. I am telling you upfront that this is an Americanized version of Pad Thai but it tastes like authentic Pad Thai. Authentic Pad Thai uses tamarind paste which can either be difficult to locate or just not as realistic because you will probably only ever use it for your Pad Thai recipe. Instead, I’ve used the classic substitute of lime juice and rice vinegar. I’ve also used brown sugar in the place of palm sugar. Our other cast of characters that we simply whisk with our lime juice, rice vinegar and brown sugar include soy sauce, fish sauce, peanut butter, chili sauce, dried basil, dried coriander and pepper. This dynamic sauce is simple but tastes authentic with its tangy, savory slightly spicy kick. 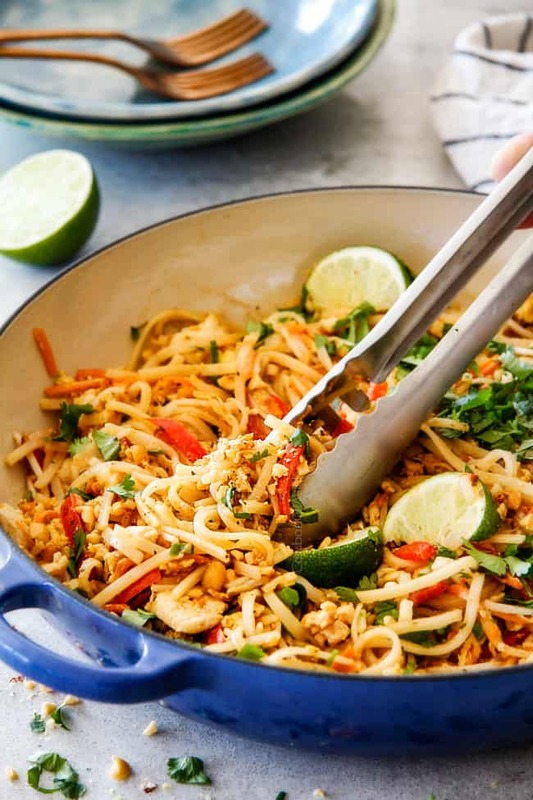 Aside from tasting yummy-licious, a great thing about making your own Pad Thai Sauce is you can completely customize the Pad Thai Sauce to your liking. Add more chili sauce if you like it spicer, add more lime juice if you like it tangier. 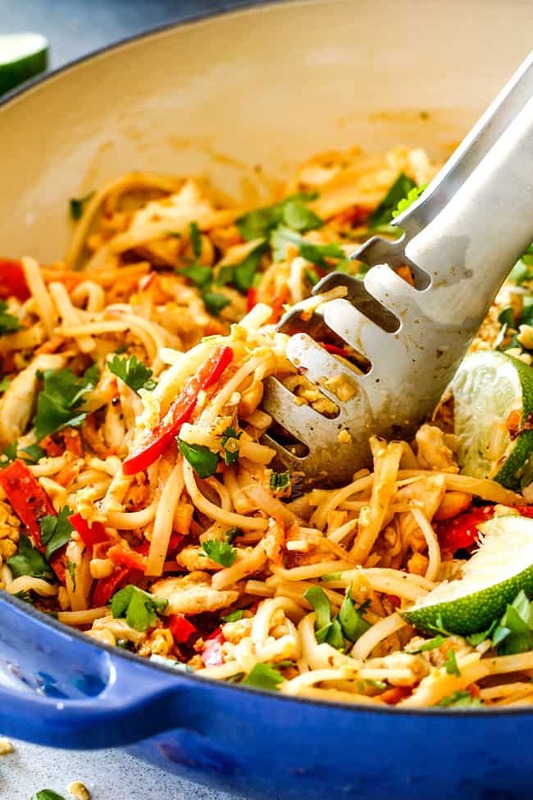 I tend to like it tangier, so in this Chicken Pad Thai recipe, I have you cook the Pad Thai in the sauce and then have you taste it and add one additional tablespoon lime juice to give it more tang. If some of your eaters like it more tangy or spicier, individuals can customize their own servings with fresh limes and chili sauce. As previously discussed, don’t overcook your Pad Thai noodles so they are perfectly chewy. For maximum efficiency, use the time while the noodles are soaking to whisk together your Pad Thai Sauce ingredients. Have your Pad Thai Sauce ready and all your chicken and veggies chopped before you start cooking because the actual cooking process is super quick and you want everything ready to go at your fingertips. If you don’t like heat at all, start with less than one tablespoon chili paste. I would say 1 tablespoon is about a 3 on the heat scale at a Thai restaurant, which is what most people order. Garnish, garnish, garnish! 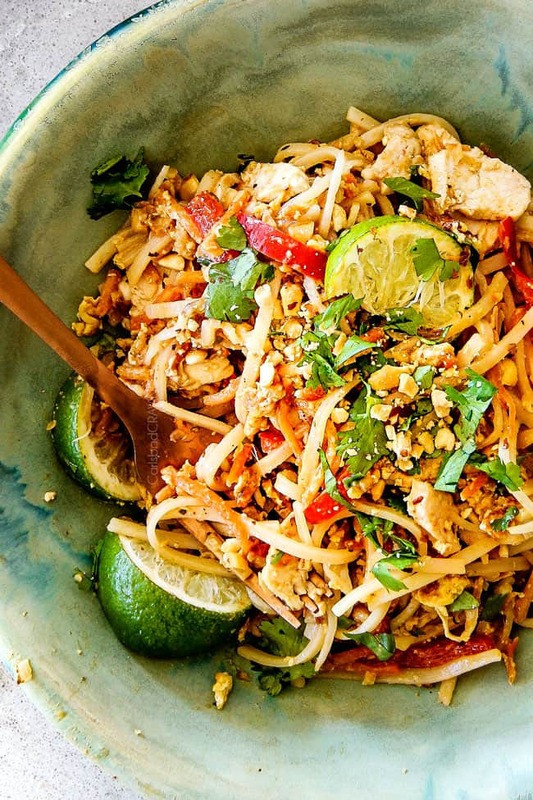 Crunchy peanuts and cilantro are the crowning glory of this Chicken Pad Thai! I love that by making Pad Thai at home you can customize to your own tastes by adding different vegetables or proteins and making it tangier, sweeter or spicier. Veggies: As far as veggies go, I’ve included red bell peppers, matchstick carrots and bean sprouts because this combo is my fav out of everything I’ve tried buuuuut you can omit the red bell peppers and carrot or substitute them for whatever veggies you want. Having tried different combinations, however, I DONT suggest skipping the bean sprouts. They add a fresh crunch that will be missed. Shrimp Pad Thai: If you don’t want to make Chicken Pad Thai, you can leave the chicken out or substitute it for shrimp or tofu. If substituting shrimp, use 8 oz. peeled, deveined medium shrimp. Cook them as you would the chicken just until opaque, about 3 minutes. Remove to a plate per the chicken instructions. Tofu Pad Thai: For Pad Thai with tofu, use 4 ounces of extra-firm tofu, cut int 1/2 inch cubes and add them to the skillet with the noodles at the end of cooking. 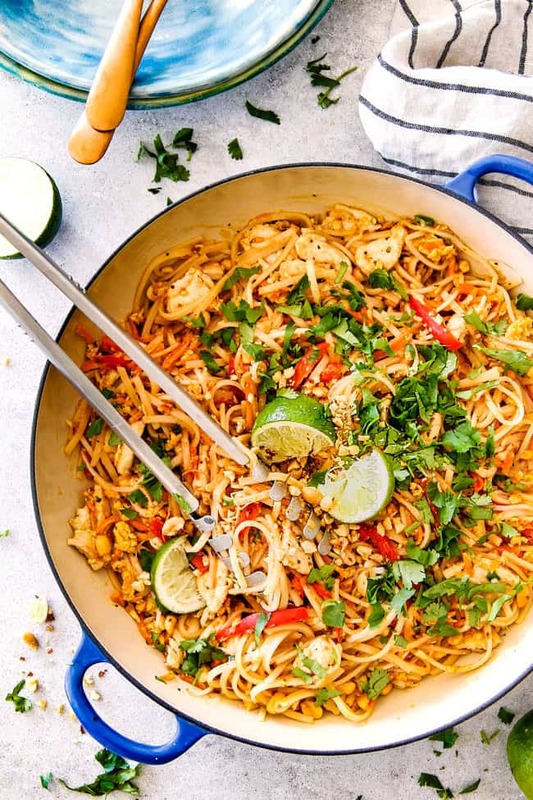 Now that you know more than you ever wanted to about Chicken Pad Thai, it’s time to go make your own world famous worthy Pad Thai in the comfort of your own home. In 30 minutes. 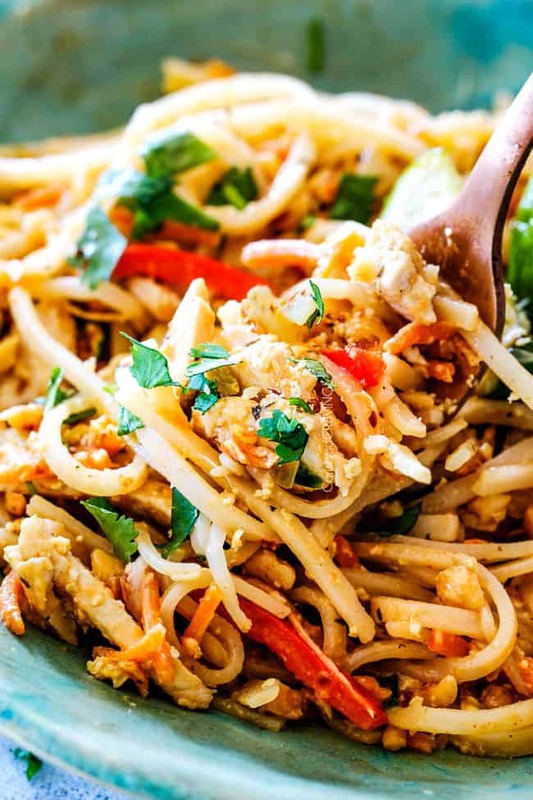 Want to try this Chicken Pad Thai Recipe? 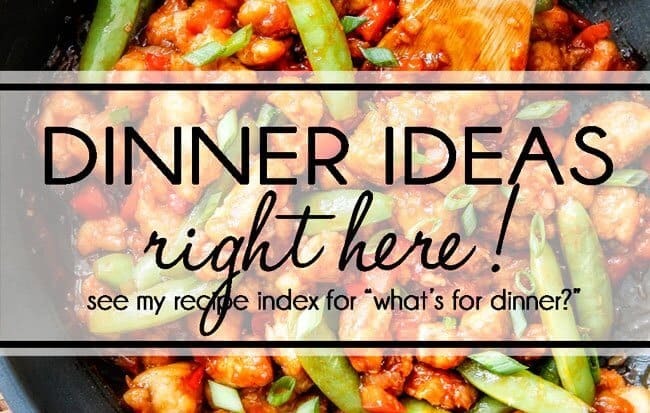 Pin it to your ASIAN, CHICKEN, DINNER or 30 MINUTE MEALS BOARD to save for later! 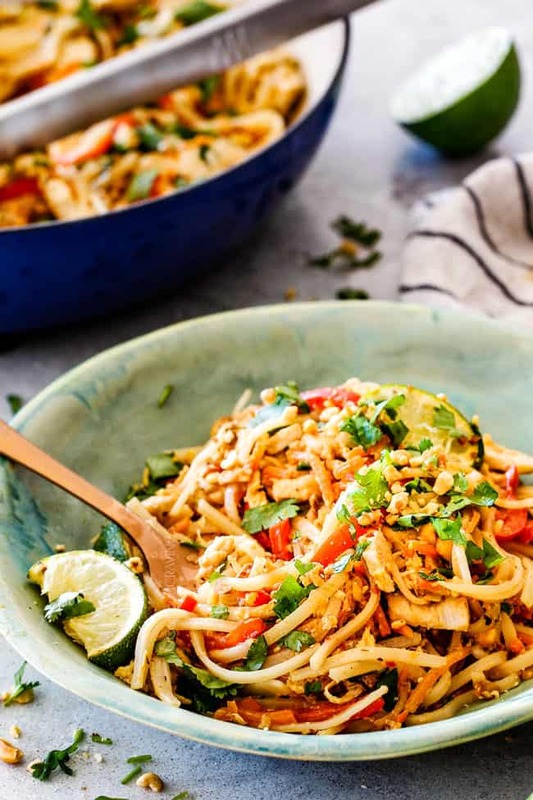 This Chicken Pad Thai Recipe rivals any restaurant but is made with pantry friendly ingredients, is less expensive and on your table in 30 minutes! Devour your favorite Chicken Pad Thai smothered in the most irresistible savory, sweet, salty, sour Pad Thai Sauce with crunchy peanuts and veggies! You can completely customize your recipe to include whatever veggies or protein you want to make it Chicken Pad Thai, Shrimp Pad Thai or Vegetarian Pad Thai! The possibilities are endless and so is the deliciousness! Prepare rice noodles according to package directions, taking care they are a slightly crunchy/al dente because they will cook more in the sauce. Rinse noodles in cold water, drain and toss in with 1 teaspoon olive oil. Set aside. Add all of the Sauce Ingredients to a medium mixing bowl. Whisk together and set aside. While rice noodles are soaking, heat 1 tablespoon olive oil in a deep large nonstick skillet over medium high heat. Once very hot, add chicken and let cook undisturbed for 1 minute then continue to stir fry just until cooked. Transfer to a plate. Wipe out pan. Heat one tablespoon olive oil over in same skillet and heat over medium high heat. Add bell peppers and shallots and sauté 1 minute. Add carrots and garlic and sauté 1 additional minute. Reduce heat to medium and pour beaten eggs over vegetables and cook, stirring constantly, just until scrambled. Add sauce and noodles and increase heat to medium-high. Toss until evenly combined and continue to stir and cook until noodles are al-dente, 1-2 minutes. Stir in chicken, bean sprouts, green onions and peanuts and heat through. Taste and add one additional tablespoon lime juice if desired for more tang (optional, I prefer it this way) and chili sauce to taste. Top with cilantro and serve. *Rice noodles can usually be found in the Asian section of your grocery store. Sometimes they are called stir-fry rice noodles. If you can't find them, then Amazon is a great option. I have made this in the past, but now have an exchange student living with us with severe allergies to all nuts and peanuts. I suppose leaving out the peanut butter will ruin the dish? Hi Pamela, I definitely consider the peanut butter an important factor to what makes this taste like Pad Thai so leaving it out won’t ruin it, but it will change the flavor profile. You rock, Jen! I made the Chicken Pad Thai tonight and now I don’t ever have a reason to go out for Pad Thai again! I have made several of your recipes and they are all amazing. Thank you for sharing with all of us. When I make your recipes, I know it is going to be an outstanding dinner! Thanks so much for your kind words Christine, I’m honored my recipes are trusted and loved in your home and this Chicken Pad Thai was another winner!